Race 2 of the last round of the 2018 WorldSBK Championship at Losail (Qatar) was cancelled due to bad weather, which resulted in heavy albeit unusual thunderstorms all across the surrounding desert. Track conditions, with a mostly dry tarmac but a few corners crossed by streams of water, prompted Race Direction to cancel the race in accord with the riders. The Aruba.it Racing – Ducati team thus claimed second place in the Riders Championship with Chaz Davies, who took two wins and 12 podiums overall this season for a total of 356 points. Marco Melandri finished the season in fifth position with two wins and ten podiums, with 297 points to his tally. 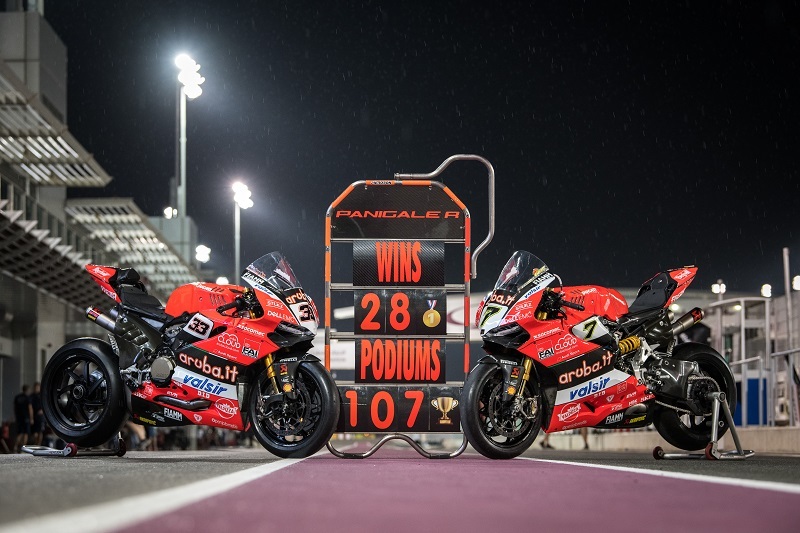 The Qatari round also marked the last race of the Panigale R, which in WorldSBK has collected 107 podiums overall and 28 wins in six years. The Aruba.it Racing – Ducati team will resume action at Aragon (Spain) on November 14-15 for Chaz Davies’ first test with the Panigale V4 and it will continue the development program in full swing with also Alvaro Bautista at Jerez (Spain) on November 26-27.